Your typical ice cream in Japan is rather vanilla. Things usually don't get much crazier than green tea. But in some places, the ice cream gets downright strange. Viper ice cream, anyone? The above containers read "mamushi" (まむし) in Japanese, and on the label, right next to "almond," that is exactly what's listed as an ingredient. In Japan, this kind of ice cream is called "novelty ice cream" (変わり種アイス) or "strange ice cream" (奇妙なアイスクリーム). 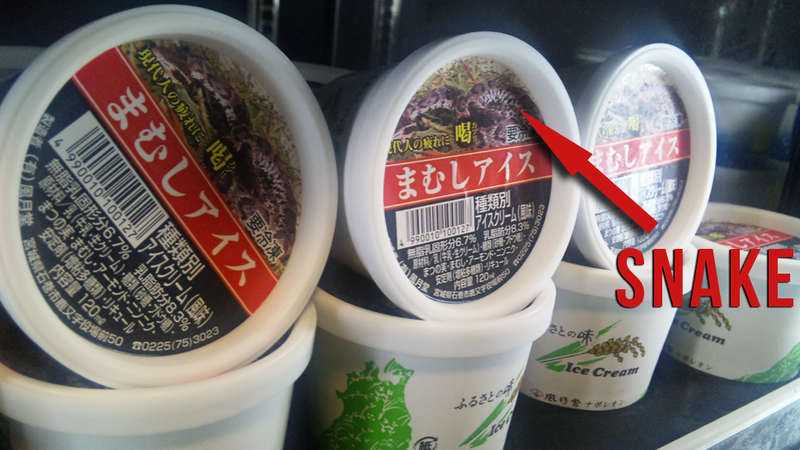 Sadly (or thankfully, rather), you can't really walk into any old Family Mart in Japan and buy snake ice cream. You'll probably just find a buncha Häagen-Dazs flavors. A Namco-run "food amusement park" in Tokyo called Namja Town used to have an ice cream museum called "Ice Cream City" that displayed many of these flavors. However, that attraction ended last year. But if you look around can find smaller ice cream makers, crafting truly odd flavors. You know, like "raw horse meat" (above). Then, there are soft cream stands who whip up all sorts of interesting treats, such as squid ink-flavored ice cream (below). Some of the ice creams are just "flavored." Others have little bits of stuff in them. These novelty ice creams are sold in local areas—often tourists spots. So, even when Japanese people traveling within the country happen upon these flavors, they are very surprised. Soy sauce. Hrm, not too bad. Soft serve ice cream with fried oysters. Oh boy. Shark fin ice cream with, apparently, actual shark fin. GOODNESS. That's monjayaki ice cream. And yes, monjayaki looks like barf. Nattou ice cream. Nattou is fermented bean that smells... pretty bad! Japanese pickle flavored ice cream. Slow boiled egg with ice cream. And marzipan, that ain't. Salad ice cream. Notice the cucumber and the red bell pepper? Eel ice cream with a type of Japanese pepper. Chicken wing ice cream, which apparently tastes like vanilla... and chicken wings. Crab ice cream. It's handmade! Octopus with soy sauce ice cream. You didn't think we'd make it through without octopus, did you?